We got the chance to do this on the Saturday of our travels to Ireland. It happened to be an important day on two levels -- it was the third anniversary of my dad passing, and my travel partner's birthday. Kind of a weird thing, no? Two very distinct celebrations, and, almost, appropriately opposite. Without one we cannot have the other. I had my time to go visit a church, light a candle, do an ugly cry, and make peace, again, with things. It was good...I found a lovely church which reminded me very much of one here at home where my dad always tried to get me to attend mass (and said he would come join me, though he never did, even when I took him up on the offer). So, because of the day, the importance of just being became even more so to me. It was important to just take part and be alive in what we were celebrating -- and I for one was completely focused on that. A & I found the cheese shop he really wanted to visit, and grabbed a bunch of cheeses, bread, meats, and what nots needed to have a little picnic. 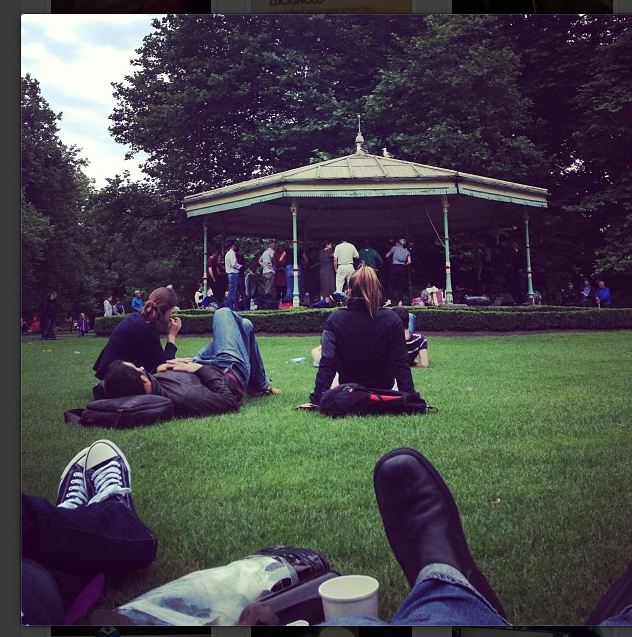 Then we made our way over to St. Stephen's Green. I think both of us were expecting a bit of a bigger park -- a la Central or Golden Gate Park -- so we searched for a bit for the right amount of green space. We landed on a plot near the bandstand; I am so glad we did. 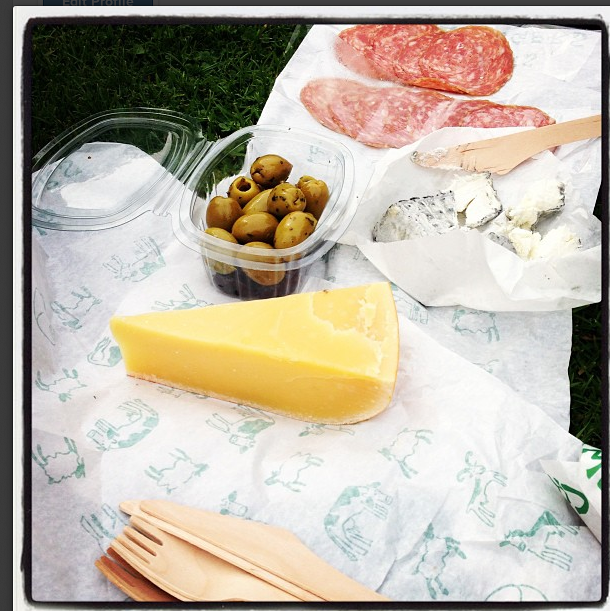 We laid out our spread as people started to congregate at the bandstand. As luck would have it, those gathering were there to practice a little swing dancing. There were only a few people around us -- period -- when we first arrived, so we had found the best spot. And this is where I started to think the universe has a funny way of letting itself be known. We sat and ate & drank, all while watching swing. This was one of my dad's favorite dance styles, and one he always made sure we danced to (when I could fight off my aunt). Soon, a song came on that we always danced to...the last time we had, he lectured me on drinking water between my actual drinks, and reprimanded me on not being a great follower... and all I could think was how strange and appropriate it was that this song -- that I hadn't heard in years -- would be playing here, on this day. I had struggled a bit with decided to stay extra time in Dublin, and this just made me feel at peace with my decision. As I watched the people dance, and had another little cry, A took a nap, and the teenagers beside us had a great time chasing and flirting with one another (and reminding the rest of us that being a teen is hard work). More people arrived to sit around us, and it was such a great experience of just sitting and being. There wasn't a lot of talking, rather, there was a lot of just being a part of what was going on. From the teens playing "I have your hat" to the man on the phone allowing his baby to crawl around after him, it was such a great moment.